Demand for construction has increased over the past five years, and employment in the sector is currently at its highest level since 2008. However it is expected that demand will start to decrease in 2019 and 2020. 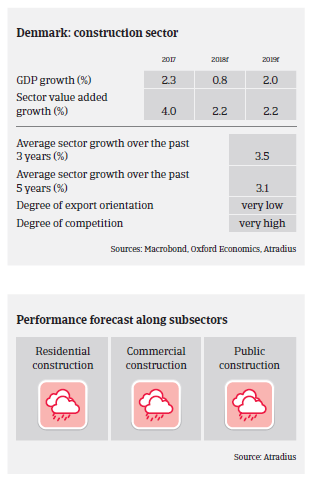 Despite the still benign demand situation competition is fierce in the construction market. Many mid-sized players have expanded their activities beyond their traditional local markets to all over the country, which has led to lower sales prices. This, combined with increased prices for building materials and higher labor costs, has triggered a modest decline in profit margins, which are expected to decrease further in 2019. The average equity ratio of Danish construction businesses has increased from 30% to 33% over the past three years and is considered acceptable. While banks´ general willingness to provide loans have improved over the past five years, the approach is still cautious at times. The volume of protracted payments is higher than in other industries, mainly due to many commercial disputes in the construction sector. After a period with few non-payment notifications 2018 saw a general increase, and another slight increase of 2%-5% is expected in 2019. The insolvency level is high compared to other industries, and after increasing in 2018 business failures are expected rise further in H1 of 2019, by 5%-10%. This trend is primarily the result of many very small businesses failing. Demand in the residential construction segment is still robust, but prices for existing houses have started to decline in urban areas. Commercial construction activity is expected to decrease in 2019, while public construction activity remains rather low. Our underwriting stance has turned from neutral to more restrictive in 2018 as more construction businesses are struggling. This is mainly due to lower market prices, decreasing margins, declining financial strength, as well as higher risk of payment delays and insolvencies. Especially higher commodity prices and increased labour costs are burdening construction businesses. However, our underwriting stance remains neutral for the construction materials subsector, as this segment still benefits from solid demand, full order books and increased commodity prices.